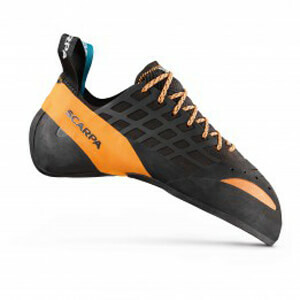 No climbing shoe with hook and loop fasteners can beat lace-up climbing shoes in stability. Find out here, which further advantages lace-ups offer and when you should rather opt for hook and loop fastening shoes. For beginners in climbing especially, who do not have much experience with rock formations and footholds, a climbing shoe with laces is a good choice. Thanks to the firm fitting of the shoe, it gets easier to learn how to stand steadily on small footholds. Moreover, this facilitates the acquisition of the right sensibility regarding the correct position of the foot. Even ambitious climbers preferably go for climbing shoes with laces: Comfortable models offer better grip on alpine touring and Big Walls, which is why they do not have to be taken off. For bouldering and technically demanding routes the hook and loop fastening version is recommendable: Their curvature is much higher, while the heel seat is less stiff than in that of climbing shoes with laces.